Being judgmental. We are all guilty of it, even if we try our best not to be. I myself try to see everyone's point of view, but there are still times when I will see something that makes me shudder or causes a judgmental thought to cross my mind. However, it seems that a lot of women and moms are going out of their way to purposely be judgmental of anyone who does not parent in the same way they do. I can't say there is no right or wrong in parenting, because clearly there are things like flat out abuse that are absolutely wrong, but for the most part, one style of parenting makes you no more superior as a parent than anyone else. So, I reach out to all of you as women. 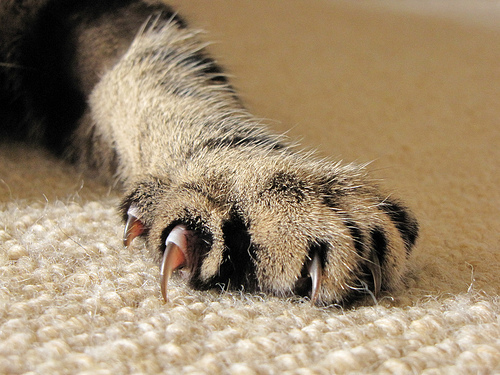 Bring in those cat claws. Clip them, gnaw them off, or just play nice if you can, but for goodness sake, please try to be more supportive of your fellow women and mothers. Just because you prefer to calmly talk your child out of situations as a form of discipline does not mean it is the only method that can be used or would even be effective on someone else's child. Or, if you choose to spank within your legal rights as a parent, it does not automatically make you abusive, but does not mean that everyone who doesn't spank is raising lazy unruly children. We all know the hot topics. From breastfeeding vs. bottle feeding, from homeschooling to public schooling. The list is endless for the things that moms can find to criticize and tear each other down about. I read an article on a popular site the other day on one of these hot topics and the comments just made me tired. Instead of fighting, arguing and picking each other apart, which takes time and energy away from our families, can't we choose to join the village and support each other? After all, it does take a village to raise a child does it not? I think our country has gotten away from that ideal, but I can remember when neighbors would look out for me and I would answer to them the same as I would my mom. It was a better time. When did the cat fights and the "I'm right, your wrong" mentality become so prevalent. Are we 5? Parenting is a long and often confusing journey that we all stumble through the best we can. Even those who think they have it all figured out can be hit by the unexpected, so let's put the claws away ladies and play nice. One thing I try to stay away from is how to parent a child. I don't want anyone telling me what to do as much as I don't feel the right to tell others. However women I have to admit are the world's worst at righteousness and doing just that. Amen! Parenting is a long confusing journey and not everyone will take the same path to the goal of raising happy healthy children.